Particular attention is paid to recording the appearance of crime scenes through narratives, photographs, videos, audiotapes, or sketches. A guide for professional forensics experts and an introduction for laymen, the FBI Handbook of Crime Scene Forensics makes fascinating reading for anyone with an interest in investigative police work and the criminal justice system. 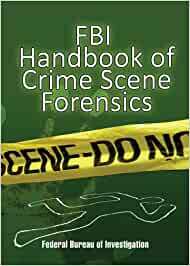 Start reading FBI Handbook Of Crime Scene CSI Forensic Procedures on your Kindle in under a minute. The Federal Bureau of Investigation is the investigative arm of the US Department of Justice. It is headquartered in Washington, DC. Dr. Jacqueline Fish is the Vice President for Academic Affairs and a professor of criminal justice at Charleston Southern University. She is the author of forensics text books including Crime Scene Investigation, Practical Crime Scene Investigations for Hot Zones, and Crime Scene Investigations Case Studies. She resides in Charleston, South Carolina. As a writer, I enjoy digging into the characteristics that make people unique. As a reader who enjoys a good twist of murder and mayhem in the storyline, this book becomes a wonderful tool for researching what makes a crime scene realistic. If you are the curious sort, you might find this an interesting book too. It is a textbook though, not a story, you need to know that going into it. It is what it purports to be, Don't buy this though, you can get the guidelines for free. This is not useful unless you are submitting evidence to the FBI. 1.0 out of 5 starsCould have been useful but didn't get that far. This may have been a useful text if not for the poor conversion to ebook. There was absolutely no formatting, and most of the words were missing letters (usually vowels). If you need this book, I definitely recommend purchasing a hard copy. One star for the ebook. This was a great reference, one that I used to gain more insight into my study of Public Safety Emergency Management, and Criminal Justice. I will pass the text to others through donating it to the public library and after completing my Doctoral Degree. Not worth any price that is charged for this booklet. Teaches nothing in the way of forensics and so does not meet expectations.